The refusal came a day after Jammu & Kashmir chief minister Mehbooba Mufti said all parties in the state agreed to the ceasefire proposal. New Delhi: The ruling PDP’s alliance partner BJP Thursday refused to support calls for a unilateral ceasefire in Kashmir during Ramzan. The refusal came a day after Jammu & Kashmir chief minister Mehbooba Mufti said all parties in the state agreed to the move. 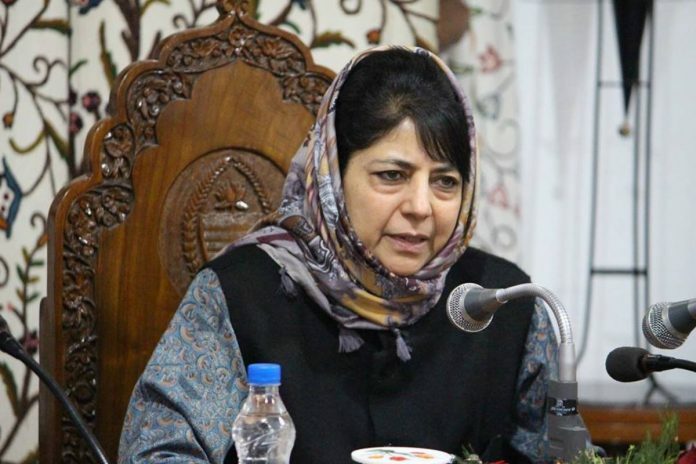 Mehbooba had made the statement after an all-party meeting convened to discuss the worsening security situation in the state amid civilian deaths in encounters and the general turmoil. She said the parties would make an appeal to the union government “to consider a unilateral ceasefire on the lines of Vajpayee’s, so that the people of Kashmir have some relief from encounters and search operations”. The meeting also pushed for dialogue with Pakistan. The BJP said such a ceasefire would go against the “national interest” and “could wash away the Army’s efforts” in the state. “We are in complete disagreement and the chief minister cannot pressure us on this,” Jammu & Kashmir BJP spokesperson Sunil Sethi told ThePrint. “It is not going to do any good. The Army’s operations to neutralise militants have been successful,” Sethi added. The PDP said the BJP had not raised any objection at Wednesday’s meeting. “The BJP did not propose the ceasefire in the meeting but they didn’t oppose it either. Their view would be taken into consideration when the authorities initiate a ceasefire,” PDP spokesperson Rafi Ahmed Mir told ThePrint. “As far as we are concerned, we think a ceasefire is a must at this time because we need to…give our people respite,” he added. Mir said that the meeting had built an “over-all consensus on ceasefire and when it has to happen”, and that all the parties concerned, including the security forces, would be taken into confidence. Speaking about the BJP-PDP ‘Agenda of Alliance’, or their coalition agreement which was one of the issues raised at the meeting, Sethi said it was being implemented, but talks with the Hurriyat and Pakistan hadn’t taken off because “the other party” was not “responsive in creating an atmosphere conducive to talks”. Sethi said Prime Minister Narendra Modi’s visit to Pakistan in December 2015, just before the terror attack on the Pathankot IAF base, underlined how serious India was about talks with Pakistan. “We cannot appeal to the Centre to go down on its knees. Talks happen when both parties are on equal ground,” he added.